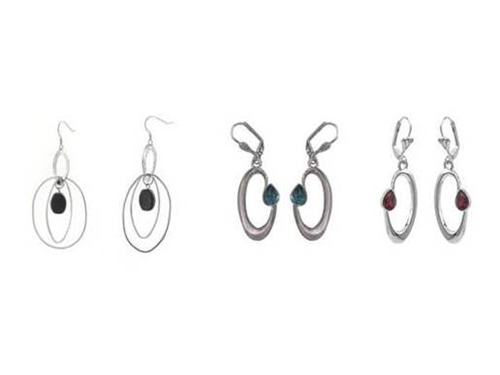 Earrings – available in 3 styles. Rock My World – 2 1/3” long – Metal with faux onyx. Aquamarine Touch of Color – 1” long – Metal with aquamarine colored crystal. Ruby Touch of Color – 1” long – Metal with ruby colored crystal. Nickel-free. For pierced ears only. 100 pairs of each style. Packaged in clear plastic bag.